Chris grew up in New Orleans, LA with an obsession for caring for and treating all the sick (and stray) animals in the neighborhood. She decided then that being a doctor was her path and goal in life. While attending Tuskegee University for veterinary medical school, she expanded her knowledge at Zoo Atlanta, Atlanta Humane Society, Iowa State University vet school, and the National Animal Disease Center. 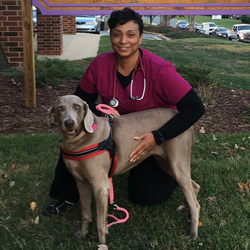 After graduating in 1999, she has worked at several vet practices before starting her own independent relief veterinary service, where she worked at over 10 practices (including Brawley Animal Hospital) in the greater Charlotte and surrounding areas. Chris now resides in Monroe, NC with her husband, Patrick, and their 3 children (Stella Storm, Super Cooper, and Loo Loo… yes, they are dogs). They all enjoy football, basketball, and sleeping (definitely in that order). Her veterinary areas of interest are general surgery and geriatric medicine. She joined the Brawley Animal Hospital family in June 2016 and couldn’t be happier to work with such great people and wonderful patients. We could not be happier to have her here as part of our team.